Beige is an awful colour, this I know. 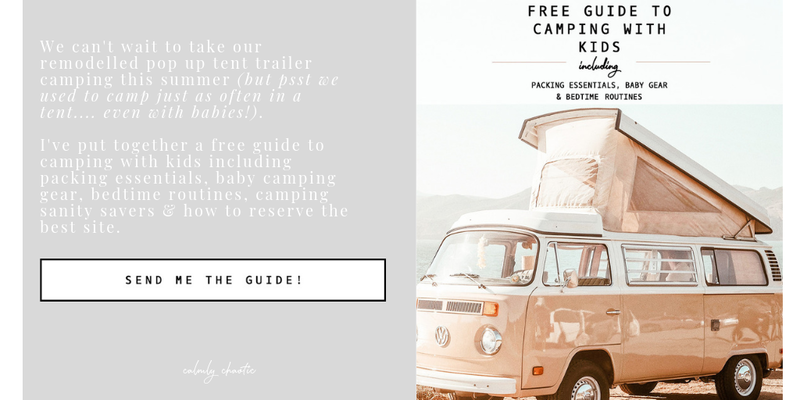 Yet, here I was actually considering it for our tent trailer remodel. I mean it is just a tent (I tried to tell myself), and I've been know to tire of colour, so a neutral would be the safe choice for reupholstering the cushions. But if it is just a tent, and we are going to the trouble of remodelling it, then why not make it fun? Two years ago I was shopping for yarn at a local shop called Wabi Sabi, after I decided to add "textile artist" to my resume. 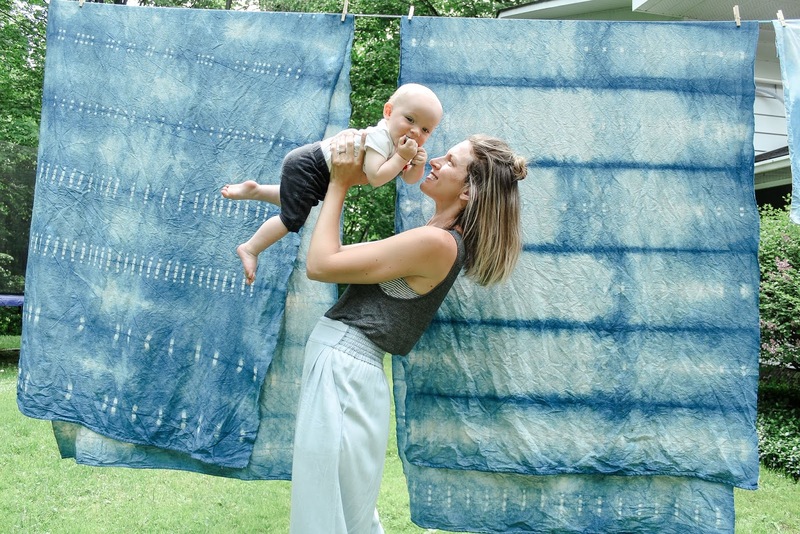 While I drooled over the softness of their merino (and wondered whether anyone would actually appreciate such a pricey fiber in a woven wall hanging), I spotted a box of indigo dye and I remembered seeing curtains that Sarah Sherman Samual dip dyed indigo in her original master bedroom. They were so pretty in my mind, that I bought the dye, put it in with my yarn stash and then forgot about it. 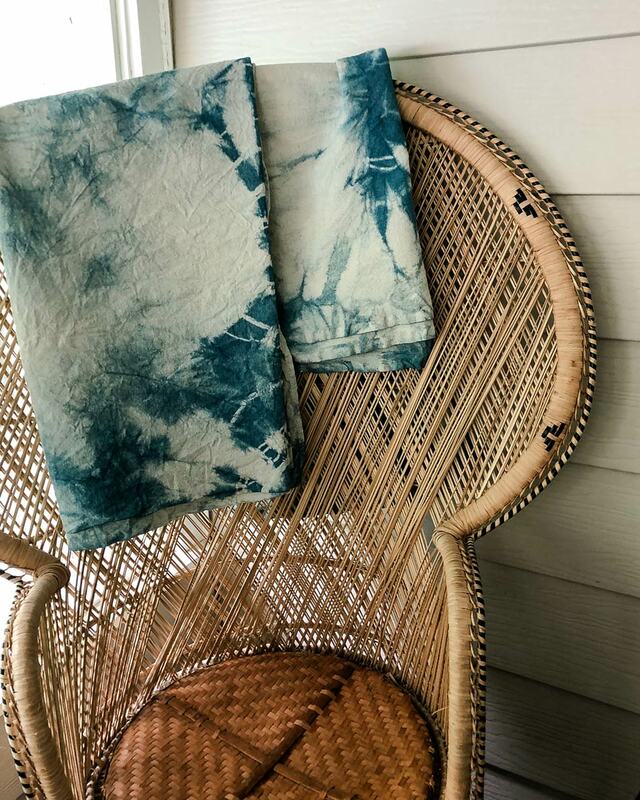 I now believe it was merely awaiting its moment to shine, because this DIY indigo shibori upholstery turned out better than anything I ever imagined. A large stick - I used a foot and a half long 2x4 we had left over from a deck project. Access to water - since I did the dying in our backyard, I used the garden hose. Old clothes because this dye is potent! Dying anything is a loaded affair - one wrought with staining, imperfection and in Ottawa in May - lots of bug bites. My material of choice was drop cloths that my Mother-in-Law picked up for me at a local paint supply store. 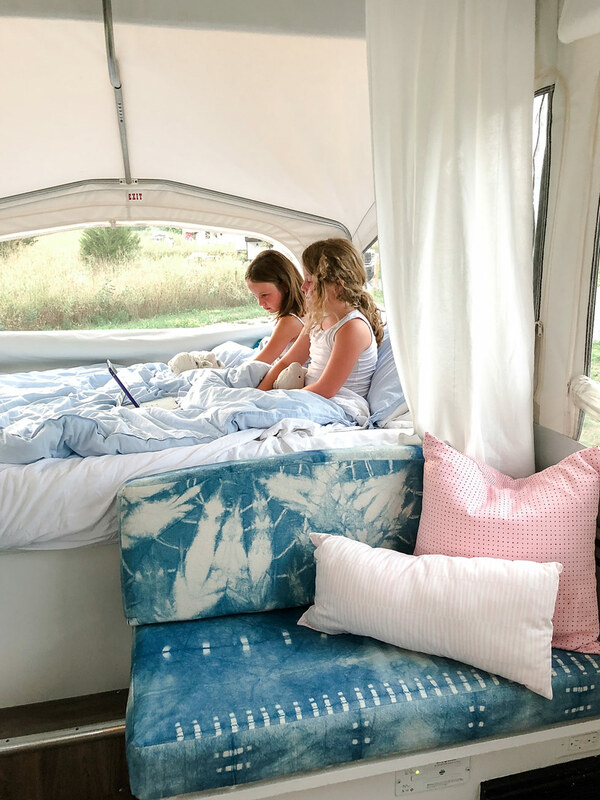 We chose this fabric because it was inexpensive and I'd read enough drop cloth slipcover tutorials to be fairly confident it would stand up to regular summer camping wear. They also had a nice weight and I liked the natural colour of the fibre. First came the fabric prep. I washed each drop cloth in our front loader with regular detergent and line dried them in the backyard. Next I researched various dying techniques and settled on an accordion fold with clothespins for two of the drop cloths and kumo, a shibori technique involving folding and then binding with elastic bands for the other two drop cloths. The accordion fold involves folding and folding again until you get your fabric small enough to be able to be submerged in your bucket. I didn't clothespin too intentionally as I wanted the pattern to be imperfect. With this technique, you clip your clothespins along the folded edges. The Komo technique was tricky with this heavy a fabric and many elastics snapped off. I started by folding the drop clothes into larger accordion sections and then I just scrunched different parts together and attempted to bind the peaks with elastics. Next I prepared the dye bath of dye according to the kit instructions and then I soaked each drop cloth (whether it be clothes pinned or elasticized) with the hose before putting it in the vat of dye. Dipping the fabric into the vat was interesting considering how long the drop cloths were. I was sure to thoroughly soak the whole fabric. If you want the indigo colour to be darker, you simply re-dip the fabric in the vat with the clothespins or elastics still attached. I chose to only dip once as I liked the look of the colours after one dip in the dye. Next I laid the fabric on the grass and worked through each drop cloth until all four were complete. I then removed all the clothes pins and elastic bands and hung the drop clothes on our clothesline. The next day I rinsed each drop cloth with the hose making sure the water ran clear, then I put them through our front loaders with a gentle detergent. After two days of washing, line drying, elasticizing, measuring, folding, clipping, clamping, clothes pinning, I found myself a human mosquito dinner, latex gloves deep in indigo dye, watching some kind of magic happen. Maybe it was the fact that I had been feeling severely deprived those days, in all the ways I told myself are not supposed to matter at that point in time. My life was full of long, busy newborn days, but it was completely empty of creative pursuits. But swirling around that vat (real terminology my friends), felt so damn good. 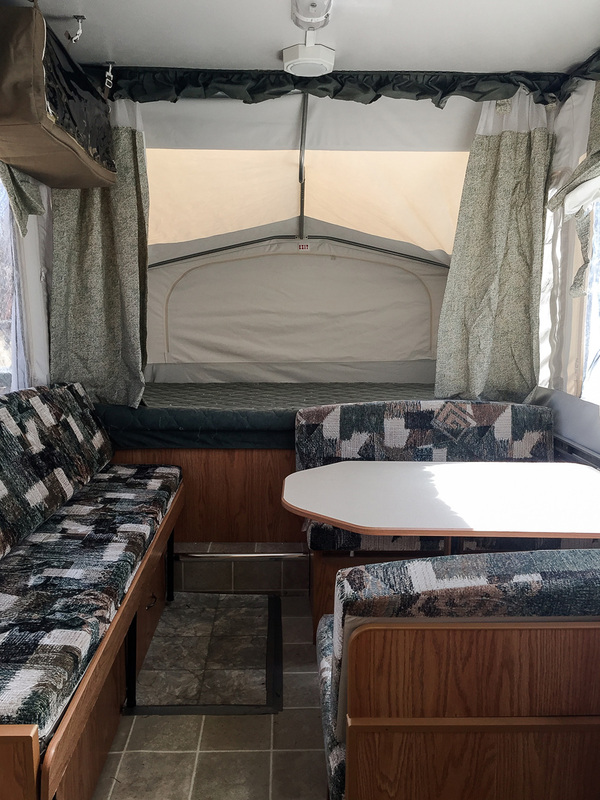 Our overall plan with the pop up trailer included new floors, painting all the wood out white, removal of anything that fell into the category of “valence”, spray painting all hardware and deep cleaning like crazy. We did all of that and a little more and I will share more pictures when the snow melts and we can pop her open again. But for now, back to the fabric. To sew the covers, my Mother-in-Law meticulously measured the existing cushions and made an envelope enclosure at the back of each cushion using velcro. She pulled the covers on directly over the old ones, after leaving them out in the sun for a good while to (fingers crossed) kill any funk that may have been present. The day she brought the finished cushions over felt like Christmas morning! They were better than I'd hoped! It is all in the planning. 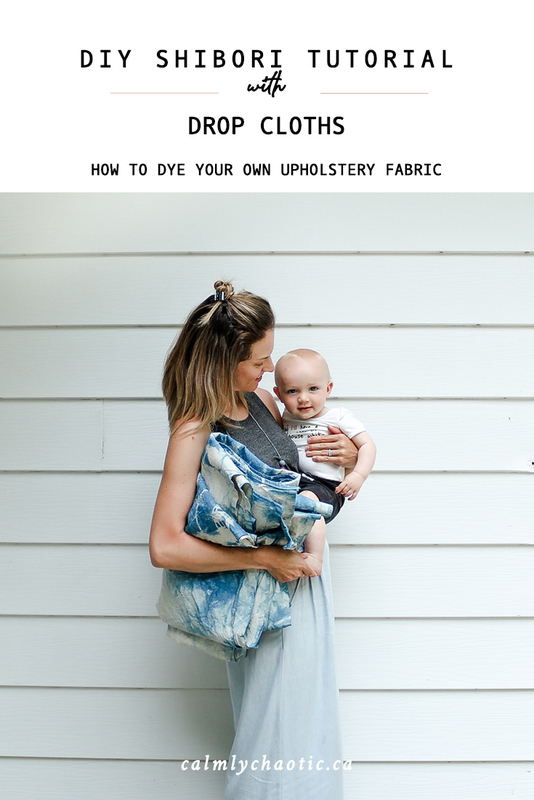 Pinterest is your shibori technique BFF. So to begin, I added a few shibori finished products to my pop up camper remodel board and then sought out to find instructions on how to make my designs somewhat resemble the techniques that I loved. 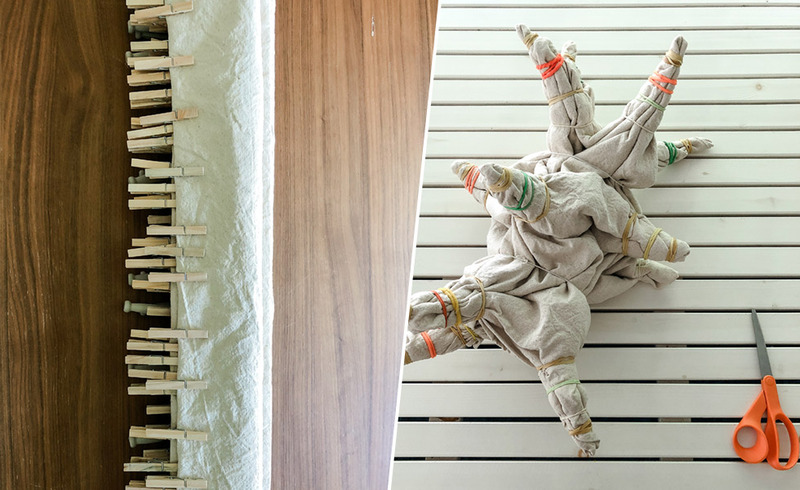 It is difficult to buy elastic bands that are robust enough to hold together drop cloth. Shibori techniques involve a ton of folds and scrunching and tying and having elastics snap left, right and centre was definitely frustrating. You need to rinse a ton. I did this with our backyard hose over and over again until the water ran clear. Next I hung the dyed drop cloths on our clothesline. Once dry, I used unicorn wash on a cold gentle cycle in the washing machine to make sure we got all the colour out that wanted to come out. Allow for a ton of shrinkage after the dying technique. I pre-washed everything before I started the indigo dying process but the pieces still shrank down even more in the wash after the dying process was over. Luckily my Mother-in-Law is a wiz with the sewing machine and was able to just make everything work for covering the pop up trailer cushions. I absolutely want to do it again! What about you? 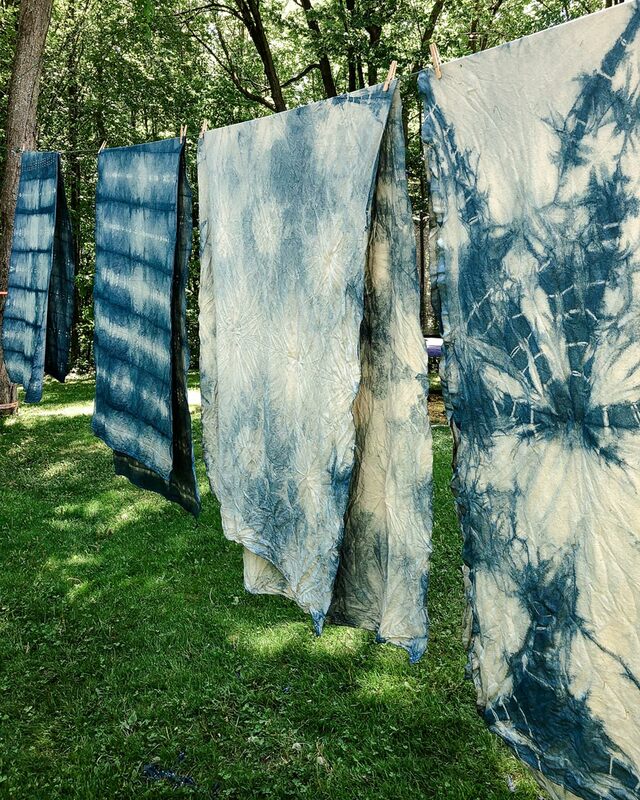 Have you ever tried shibori or would you?